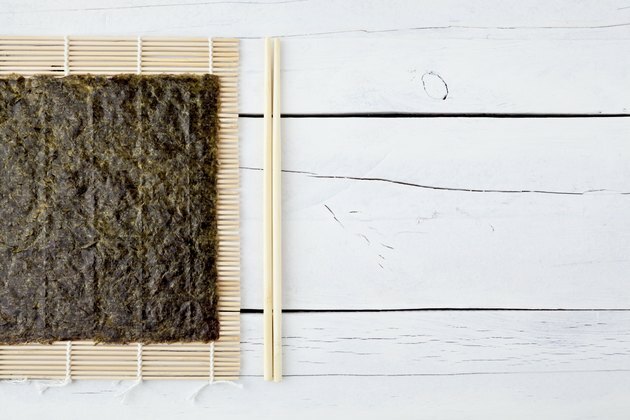 A type of dried seaweed that is commonly used in Japanese and Korean cuisine, nori is typically available in thin sheets that are cut or torn into smaller pieces. The smaller pieces are then used to wrap around a bite-sized portion of rice, as a garnish or in a variety of sushi dishes. Nori is generally regarded as safe to eat in moderate amounts and provides an abundance of healthful properties. However, excessive consumption of nori may have hazardous side effects. If you suffer from medical complications or take prescription medications, consult with your medical provider regarding your dietary needs. According to the National Institutes of Health, sodium is need by the body for proper functioning of nerves and muscles and to maintain a healthy blood pressure. The 2010 Dietary Guidelines for Americans recommends 2,300 milligrams of sodium each day; however, average American adults consume 3,400 milligrams of sodium daily, putting them at risk for health complications. According to Takaokaya.com, one full sheet of roasted nori contains 11 milligrams of sodium. While this amount may appear insignificant, some flavored nori sheets contain additional sodium. When dining out in a Japanese restaurant, consumption of sodium may accumulate very quickly among the nori, soy sauce and added salt for flavoring. Individuals on a low-sodium diet should restrict their sodium intake, as excess sodium may lead to health complications such as congestive heart failure, cirrhosis and chronic kidney disease. DHA, or docosahexaenoic acid, is a type of omega-3 fatty acid. While is it commonly found in seafood products, such as salmon, mackerel, tuna and sardines, seaweed is a vegetarian source of DHA. The University of Maryland Medical Center notes that DHA promotes proper development of the nervous system and supports brain and vision health. However, UMMC also reports that DHA may also interact with certain blood pressure medications. DHA may reduce blood pressure, thereby enhancing the effects of prescription blood pressure medications. According to Drugs.com and takaokaya.com, seaweed is a source rich in vitamin K. The Linus Pauling Institute states that vitamin K serves as an anticoagulant and protects against arterial blood clotting, thereby allowing blood to flow freely to the heart, lung and brain. However, Drugs.com reports that excessive amounts of vitamin K may interact with blood thinning medications, such as warfarin. Vitamin K, according to a report from the University of Michigan Health System, may make warfarin a less effective drug. This may increase the risk of blood clots and stroke. Drugs.com lists additional side effects resulting from excessive consumption of seaweed. Possible side effects include contact dermatitis, gastrointestinal tract upsets, goiter, cholera and inflammation. Scientific research concerning seaweed's effect on pregnant or lactating women is lacking, so expecting or nursing mothers should avoid eating nori seaweed.